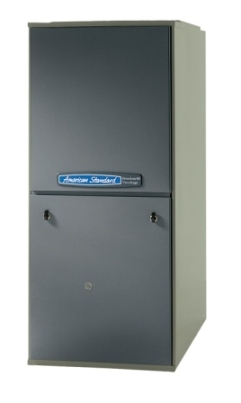 American Standard gas furnaces ranges in efficiencies from 80% up to 95% AFUE. American Standard gas furnaces utilizes variable speed motors and staging in various types of American Standard gas furnaces. American Standard also utilizes diagnostics on their controls for easy gas furnace troubleshooting and furnace safety control. Other features of various American Standard gas furnaces are washable filter, lifetime limited warranties on heat exchangers, and insulated cabinets for quiet operation. Selected American Standard gas furnaces are Energy Star rated. American became Tappan Air Conditioning division in 1972. American-Standard purchased theTrane Company in 1984. American-Standards name revived in 1988. Amercian Standard is based out of Tyler, Texas and they produce air conditioning and heating equipment along with other products for the home. In 2008 American Standard was acquired by Ingersoll-Rand along with American Standards sister company Trane. Very quiet, even heating and cooling. My bills have dropped. Not the cheapest equipment out there, but you get what you pay for. Have done lots of research on HVAC equipment and decided on American Standard. Would highly recommend! Very well built equipment. 3 Years ruining and not a service call! A friend in Richmond recommended Tim for our boiler repair. He was very friendly and able to give us a good price on fixing the problems we were having with our system. We were told by another company the year before that we needed a new boiler. Tim said opurs was fine, fixed several issues and it's now working like new! DANNYP 09/10/2011 Outstanding service He responded quickly and got the job done.Hooked up new gas line service and kept me informed,This company is the only one that actually wanted to do the job. Dear Tim, thanks so much for the prompt response in getting the furnace working at the Place Road address.